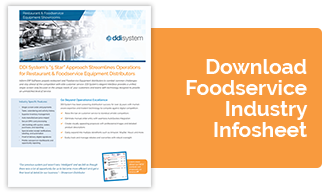 Members of the Restaurant and Hospitality Supply Industry need a software solution that can offer operational excellence alongside improvements in profitability and warehouse management. Inform ERP combines the power of integrated information intelligence with customer insights to deliver a software solution that exceeds customer expectations. Inform’s ERP software extends beyond operational excellence to updated customer data, field sales mobility, real-time eCommerce with integrated product content, and advanced warehouse management functionality. 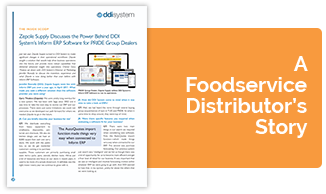 DDI System's leading technology in Inventory Forecasting, Warranty Tracking and a fully integrated CRM helps PRIDE Dealers grow their business operations and the clients they serve every day. Raise the bar with exceptional order fulfillment, inventory and demand management, CRM, mobile sales, accounting and reporting tools. DDI System’s Inform ERP includes CRM that puts detailed contact and customer information at the forefront of every engagement with your customer. Unlike third party add-ons, our CRM tools are threaded throughout daily operations, ensuring adoption and effective use. Inform ERP’s analytics provides easy-to-understand insight into the performance of critical aspects of your sales, inventory, orders, and receivables. User-selected Key Performance Indicators (KPI's) let every user build a dashboard of measures that helps them identify orders, products and customers that need their attention. Use Inform's mobile tools to give your team and your customers products, price and stock on the road. See orders and quotes, territory management, even bar-code driven replenishment. Inform's QuickOrder app puts sophisticated VMI technology into the hands of any Inform ERP user. Inform eCommerce combined with MobiOrder make deploying online business easy. Engage your customers 24/7 with real-time inventory, customer specific pricing, accessory and related items, and extensive self-service account information. As our company grew, I knew we needed a more powerful platform than our old system, QuickBooks. One of features I was looking for in a software solution was truck manifesting - a function we needed to grow. Within 3-4 months my cash flow increase as a direct result of the projected purchase order system. In addition, managing my inventory became more efficient causing less out of stocks. Without Inform, I don't know how I'd manage a warehouse distribution company, simple as that. QuickOrder has been a great asset for me when taking orders at a customer’s site. It takes away guess work or mistakes when entering an order. I love using the DDI app on my phone when doing my VMIs. It is very versatile and allows me to send quotes as I sit right across from my customer, send order confirmations remotely and save my progress on an order if I get interrupted. It has the ability to hook into my customers WiFi if needed, otherwise, I can just use my phone as long as the cell signal is strong enough. This app has increased my efficiency tremendously and has set us apart from our competitors who still have to call in orders or quote requests. Larry S. Lakeland Supply, Inc.